The success of several Early Access titles like Day Z, Prison Architect, Kerbal Space Program, and Planetary Annihilation has raised the profile of Steam's Early Access program to the point that the publishing model has become more than just a way for the smaller developers to help fund development. Many of the larger publishers, such as Ubisoft, SOE, and Square Enix, are beginning to take notice and evaluate if the strategy makes sense for their titles. At the same time, while the majority of titles released on Steam Early Access have been new IPs (85% of the 367 titles released), niche publishers such as InExile, Paradox, and 1C Company are using the model to publish existing IPs. On paper, the Early Access publishing model is a "win-win" for developers - you collect sales and grow your user base, all while developing the title and getting feedback from the consumers who are most passionate about your game. And the number of Steam Early Access releases per month has increased dramatically since the official launch of the program in March of 2013. After several pilot Early Access titles in 2012, Steam officially launched the program in early 2013 with 9 Early Access releases in March. 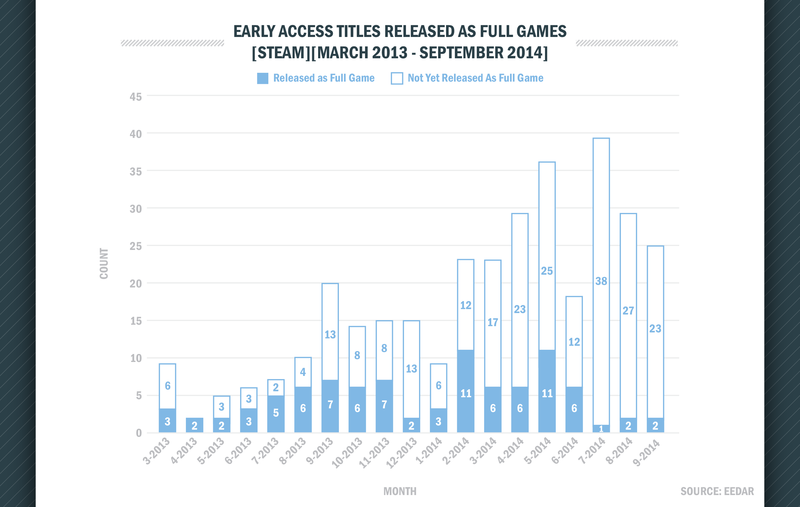 The Early Access publishing model really took off in early 2014 with over 20 games released in 8 of the 9 months since February 2014. 2014 has seen an explosion in the release of Steam titles in general with 1303 releases thus far, compared to 583 releases in 2013, a 123% increase in releases. 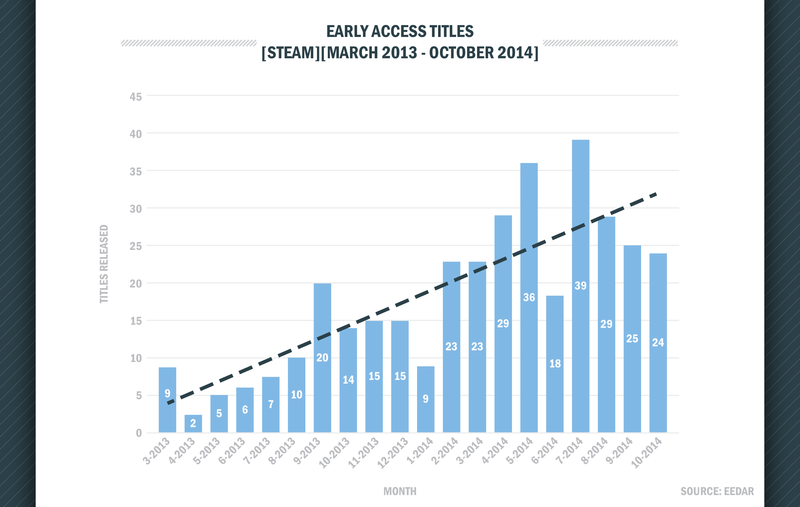 The growth in the Early Access program has kept pace, with 255 Early Access titles released in 2014 thus far, compared to 103 in 2013, already a 147% increase. And therein lies the issue. While there are clearly many benefits to an Early Access model, there is also the possibility of a broken promise to the consumer. This is not unlike other models in the games industry, such as crowdfunding through Kickstarter or selling a DLC Season Pass, where the consumer pays up front for promised content. A notable difference between those particular models and Steam's Early Access program is the lack of a firm release window; on Early Access, a game could theoretically stay in development and be sold to consumers indefinitely, whereas a Season Pass is rolled out within a specific time frame and all Kickstarter projects are presented with an estimated "delivery date". Thus far, Early Access has not received as much negative attention as these similar business models. Quite the opposite, as the Steam Early Access program has provided a legitimacy to paid beta programs outside of Steam. However, it will be interesting to see if this becomes an issue for consumers if the current trend of Early Access games spending a long time in development (or never reaching release) continues. 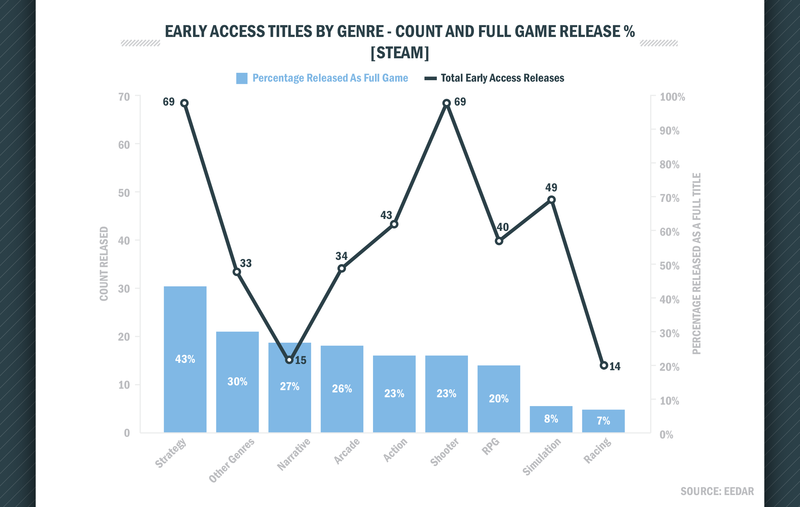 The Early Access program has been more popular for some genres than others, and some of the most popular genres utilizing the model have been seen the lowest percentage of full game releases. RPG, Action, Shooter, and Simulation are 4 of the 5 most popular genres for developers to release as Early Access products, but they are also 4 of the 5 genres with the lowest rate of reaching full release. 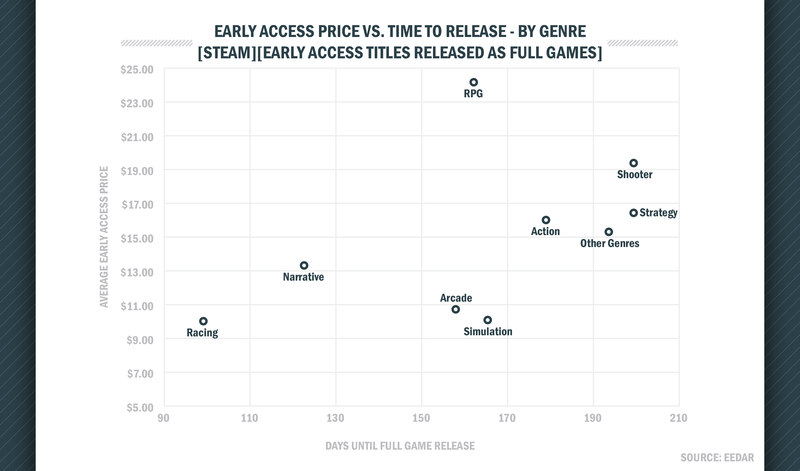 More differences in genre can be seen when looking at the relationship between Early Access pricing and how long released Early Access titles spent in the Early Access program. The average full version has been released 183 days, or 6 months, after the launch of the Early Access edition. The average price of an Early Access game (for the base edition, as many of the Early Access games have multiple pricing options) is approximately $1 more than the full game release. This demonstrates that players are essentially being charged a premium for early access to the title. While some genres feature Early Access editions that are cheaper on average than the released version, other genres such as RPG have Early Access editions that are significantly more expensive than the final product. The RPG genre is a particularly strong example of this with Early Access editions that average $24.24 compared to the full game versions at $19.87. If we examine this from the perspective of time spent in Early Access, players spend the most for the longest wait (on average). This applies to two of the three most popular genres using the program (Shooter and Strategy). As games continue through Steam Early Access and other paid beta programs, publishers and developers of all sizes should be mindful of both the risks and potential rewards of these new models. While they present an opportunity for early feedback on your product and the potential to build a groundswell of support, they also may come under increased scrutiny if current trends on full game release and pricing continue. Publishers and developers should give Early Access titles careful consideration when determining price, development timeline, and genre. Most people I meet would like the Early Access program to succeed; it offers subsidised R&D within a public laboratory without any risk unless the game is really mediocre and gets found out. This has encouraged some developers to use early access like a talent competition rather than a means to build a community around the game to work together in launching a great experience. So far only a quarter of games on early access have ever been launched (although some of these are too early to tell as they were only released on early access in the last couple of months), so maybe gamers are more wary than developers give them credit for. Thanks for this study. There certainly needs to be more information on the success of this model drawing from examples that work so other developers can set themselves up for success and fans can gain more confidence in the process. Insurgency is one of the three games released from the original nine on Steam. We know the merits of this business and development model and I'm personally surprised that the majority of Early Access coverage is focused upon the spectacular failures over the success stories. There is a lot to be learned from the new process either way. The Early Access method has even informed our post-release strategy of continuing the iteration loop based upon feedback from our community. We've released four major content updates to our customers for free, and just released with the Humble Bundle to increase visibility and community. As a studio, our engagement with the community has really heightened our reputation among loyal fans, building a sizable audience for the next game. It probably helps that we are purely indie and not bound by the traditional methods of development or business, therefore not afraid to take a risk and forge a new path. I think the issue here is the disparity in how developers use Early Access, and how the media - and even yourself view it. I can only speak for my team, but we have used Early Access to quite literally develop the title publicly. Allowing those who are willing to swim past all the warnings and "DO NOT BUY UNLESS.." statements to effectively join the team as crowd sourced designers. Allowing us a user research base of hundreds of thousands of active players while the title is created. I believe those using Early Access as a "paid beta" are only doing the medium harm - as this muddles what folks can and should expect from Early Access. Beta tests (effectively Release Candidate builds) are near the end of the development cycle, and Early Access to me is very much a "from the ground up" opt in program. DayZ hit Early Access 3 months after principle development on the project began. As soon as we hit a stable build that allowed the most basic of mechanics (Movement, looting, shooting, eating) we pushed into EA on Steam. Either way, an interesting discussion - and one I believe could only benefit from engaging more folks that actively use the Early Access model. CCP Games: EVE Online's tech is "absolutely at its breaking edge"
Warren Spector: "If immersive sims disappear, I disappear"